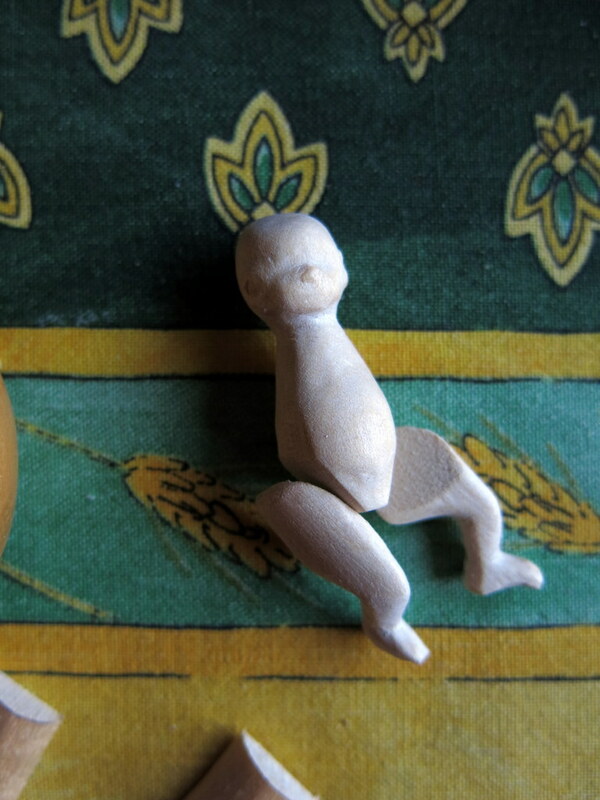 I had a project to make a Hitty-sized doll starting with an old-fashioned clothes peg, so I whittled a face and body and then lopped off the top of the peg. 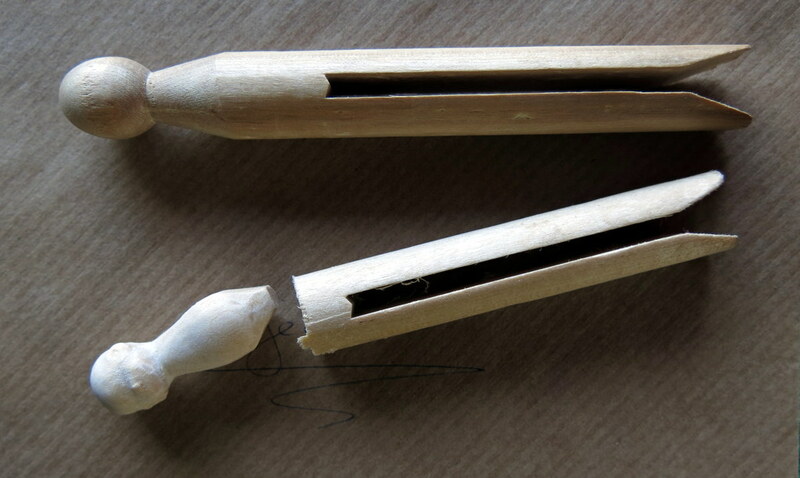 At the bottoms of the peg there were already angled cuts – I used these sloped bits for the hip joints. …and used the leftover bits to make arms. 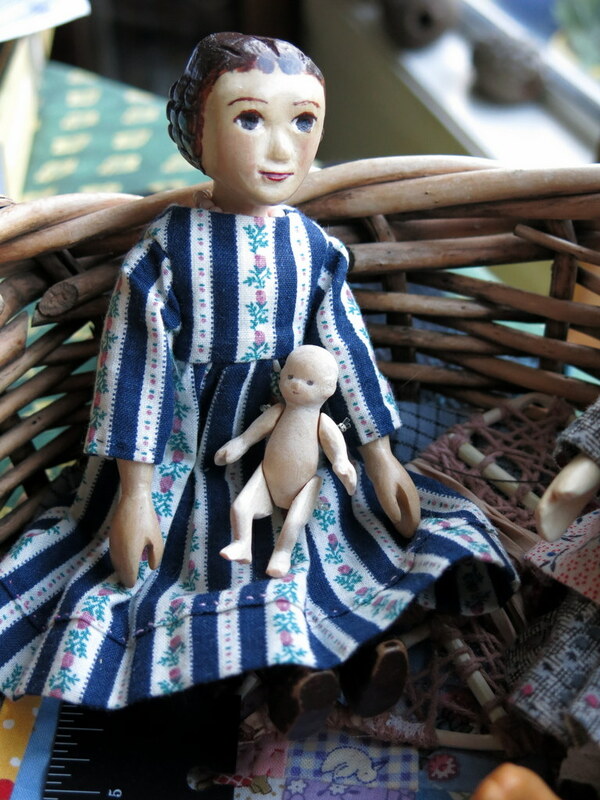 Constance is bemused, and thinks the wee dolly might need a proper face and some clothes before being given to one of her younger sisters. Gilly thinks clothes on a baby doll are superfluous! Oh my goodness, so adorable already! Wonderful carving. Thank you so much – she was really fun to carve, though I had to have sharp tools and make tiny cuts. The living room is full of teeny tiny chips! So cute! Good info, too! I’ll have to try it!! It is so nice to hear from you! It was a challenge to carve her, but helpful to have some models to look at to compare position and proportion. It was fun to try, and I am happy with the result! Thanks very much, Beth. She really was once a clothespeg! I always hope someone might make use of the pictures I share – more dolly love is a good thing! Thanks so much! It was a fun challenge, and I am so glad I tried! your carving skills are amazing! Thank you very much – I am still learning, and like any other art or craft – practice is the key (so I’ll have to make more – eh?)! I am just sitting here admiring that baby!! The Country Hittys all want to come live with you!!! You are so clever and sooo talented!!! Thank you for sharing the baby’s creation. Thank you very much indeed, but I am sure that the country Hittys would regret leaving you and their lovely country home behind – grass being greener and all that! adorable! does she have a name, Peggy perhaps? I don’t think she has a name, yet. We do have a Peggotty in the tiny doll family, so I think Peggy might be confusing…I’ll have to listen and see what Gilly says, for now she is just Dolly. This little girl is delightful. The photo of her finished face in the cradle is just precious. Your carving abilities are as special as your textile creations. Just amazing. 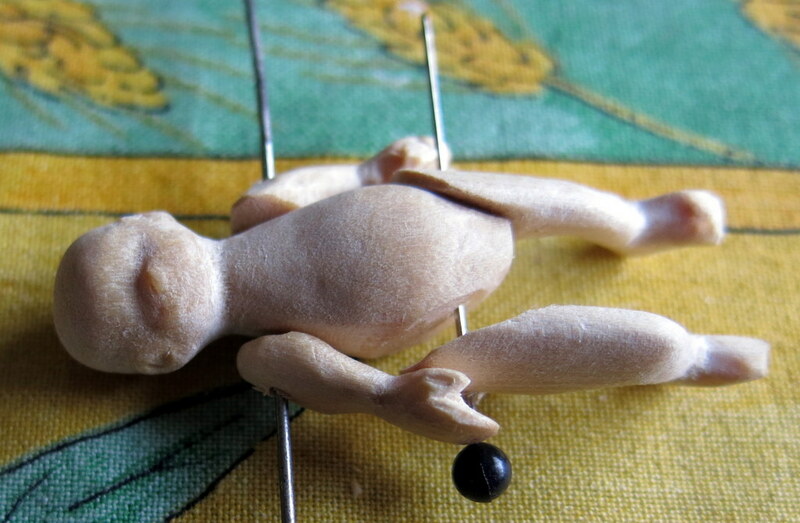 We never know what is going to come out of the wood – some times the idea does not manifest (doll-ifest?) itself into reality, but I think practice and a light hand worked this time! She’s delightful 🙂 There is such magic in working on such a tiny scale. What a darling! Thanks! 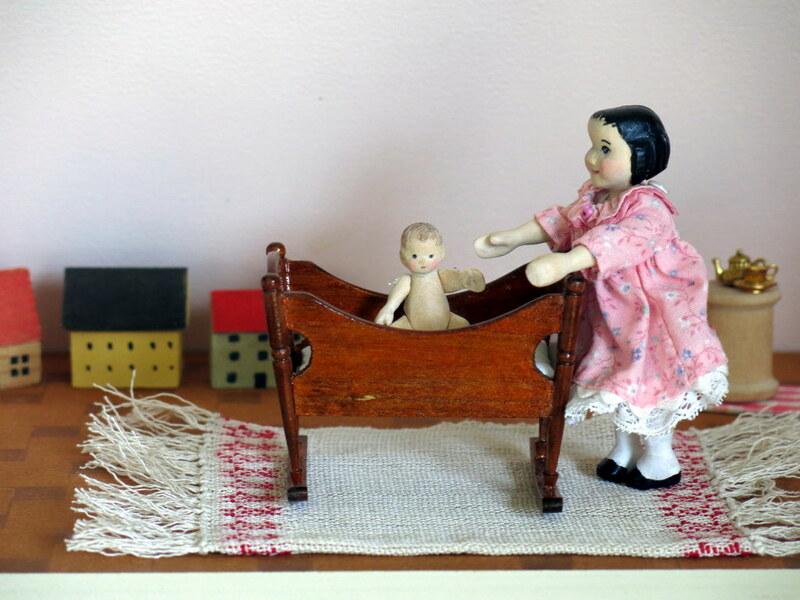 It was fun and also gratifying – we love little dolls and little doll’s dolls too!